Dave Lombardi is the most self-deprecating person I know. When I asked him to answer this Questionnaire, he wondered why, explaining, “I’m not that interesting.” Well, I beg to differ. 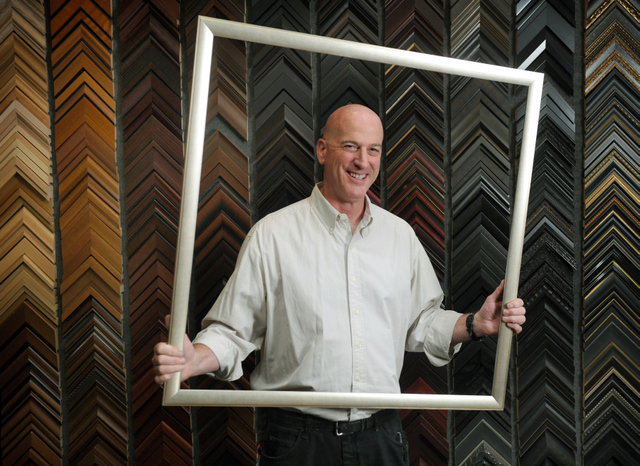 Dave runs Distinctive Framing N Art on State Street, which he opened 10 year ago next door to Opal Restaurant. Although he commutes from his home in Ventura, Dave is deeply committed to Santa Barbara’s downtown corridor — not only as a business owner, but also as an active member of Santa Barbara Downtown, where’s served as both president and chair of the safety committee. It is in the latter capacity that I’ve grown to admire Lombardi’s commitment, leadership, and passion for keeping our downtown neighborhood vibrant and vital. So on this week when we hold our annual Holiday Parade on Friday down beautifully lit State Street, I salute one of downtown Santa Barbara’s unsung heroes by submitting Dave to the Proust Questionnaire. Telling my wife we are not getting each other presents this year. What is the most unique thing you’ve ever framed? Working with and getting to know both old and new clients and helping them to create the perfect frame for their art and memories. Spending as much quality time with my wife and kids, usually involves wine with the wife and water polo and Nascar with the kids. My wife, because she has put up with me for 20 years and she is my rock and my go-to person for any and everything! My B.A.T. — big a@# T.V! Excellent, because no one wants to hear you complain! My children. God love them! Costa Rica, on a beach with my wife and a very cold beer! Not really a possession, but my relationship with Karen, my wife! Getting together with my family and my sister and her family and talking about all the nutty things we did as kids.